Just like any other craft, sewing takes years to master. But unlike most crafts, you don’t need ages to complete your first project. Yes, it will be clumsy and simple, but I promise you will be able to finish it on your first sewing day. 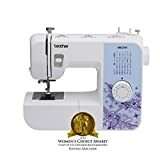 That is, of course, if you get a simple, newbie-friendly instrument like Brother XM2701 Sewing Machine. Part of their award-winning lineup, this cute Brother XM2701 machine was made with beginners in mind. It probably offers more options than many of you will ever need, so experienced sewists can enjoy it too, most suitably as their secondary machine. Let’s dig into its features and see if it’s worth buying. 2 What Do the Users Say? This machine’s 27 built-in stitches won’t leave much to wish for. They comprise all the basic stitches you need for seams, edges, hems, standard stitching, buttons. 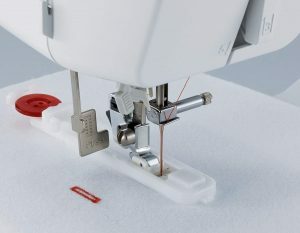 You will find a chart engraved on the machine above the stitch selector knob, so you can easily figure out which one you need at the moment without having to look it up in the instructions manual. To choose one, just turn the dial knob to the stitch number you want. While at stitches, there’s a lever you need to pull for backstitching (also known as reverse stitching). It’s a very handy little thing, since backstitching for reinforcement is an integral part of starting and finishing a seam. The stitches are combined with six sewing feet for best convenience. True enough, it’s not hard to find more feet, and they aren’t even expensive. But it’s nice to have them included in the package and have one thing less to think of. Brother’s jam-resistant top drop-in bobbin is one of their signature features, available in most of their machines. It’s easy to load and the case is transparent, so you will never run out of thread in the middle of your project. First-time sewists will appreciate automatic bobbin winding. Note that you shouldn’t use bobbins from older models, since those could make a mess. Another automatic feature of this Brother machine is needle threading. With many sewing machines, needle threading can be a nightmare, especially if you have poor sight. In this regard, the XM2701 outperforms Brother’s similar model JX2517. All you need to do is touch the lever on the side and the thread will go through the needle automatically. Another advantage over JX2517 is LED light for brightening the work area – you may assume it should come in all modern sewing machines, but unfortunately, it does not. The free arm option is a wonderful feature for working on sensitive, hard to reach areas such as cuffs, collars and sleeves. It adds to this machine’s versatility. As you unbox the machine, you will also find an instructional DVD. In less than half an hour, you will manage to set up everything and start sewing. On Amazon, this machine has 4.5 out of 5 stars, with nearly 1,000 reviewers who had a say in this. I’ve read hundreds of them, and many if not most are from sewing rookies, who had never operated a sewing machine before. A user said that he hemmed his first pair of pants within 30 minutes. It only took him once to see the instructional DVD; next time, he could thread the machine without it. 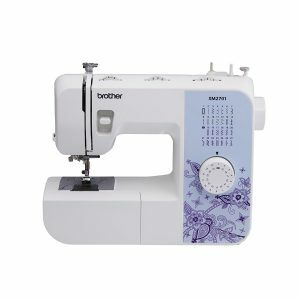 Many customers have purchased this Brother XM2701 machine as an entry-level gizmo for kids learning how to sew. But don’t think it’s a toy just because kids can learn it easily. You’re looking at a serious product for hobbyists and enthusiasts, as well as beginners. On the other hand, some customers are complaining about malfunctioning or broken parts. For some, the thread tension has issues, even though there are multiple tension levels to choose from. I’m not sure if they still haven’t got the feeling as to how much tension is too much, but maybe their machines did show such problems. Other common complaints include that the oversensitive foot pedal requires weird angles (which other users solve by sewing barefoot). Beginner-friendly yet versatile. This machine makes a nice balance between easy setup and operating and a number of functions to start using later, as your skills grow. Easy threading. Both the needle and the bobbin are automatically threaded, so you won’t need more than 10 minutes to do it, even if it’s your first time. One-step auto-size buttonhole. These buttonholes will fit buttons of any size, so you can do pretty much anything you want. Lightweight machine. With its 12.6 pounds, it’s portable and easy to carry around. Seasoned sewists can make a great choice in buying this as a secondary machine, next to your primary, non-portable, heavy duty solution. And yes, it’s not very big either. It will fit pretty much any table and you can easily move it to another place when needed. Very affordable. Some of the automatic features that this machine has, such as automatic needle threading and bobbin winding, are not very typical in low-end machines. Precisely these features account for the machine’s good value for the money. Even if you only sew occasionally and don’t want to make this a proper hobby, it will pay itself off with just a few easy projects. How many pants have you thrown away just because a hem went undone? It’s one of those machines that every household needs and should have. Quiet. Sewing machines can get really lousy, even portable ones. And that can be a huge issue for your neighbors if you’re living in a small apartment. Great for DIY crafters and home decor. The free arm that I mentioned above is priceless when it comes to small projects with lots of tricky parts. No automatic needle up/down position. You have to raise and lower the needle position by turning the hand wheel, but a button would be much more convenient. It would be of tremendous help when you want to pivot the fabric and continue sewing without losing your stitch. No adjustable speed control. Much as I appreciate machines that can stitch at high speeds, I appreciate adjustable speed control even more. Of course, you can control speed by varying the pressure on your foot pedal. But pedals have different levels of sensitivity and it’s hard to rely on your estimation alone. That’s why a speed slider (which is present in many other Brother’s models) leaves much to wish for. If you’re ready to shell out more money and snag an mid-level machine that has this feature, check out Brother SE600. LED light not bright enough. We are thankful that they installed LED lights above the work area, but they could definitely have been a bit brighter. It will do if you’re only sewing for shorter periods of time or during the day. But if you’re used to burning the midnight oil as I am, you might need some extra light. Weird placement of the presser foot lever. Since it’s located right under the arm, it takes a little bit of gymnastics to reach for it, especially if you’re right-handed. All the parts seem to be made of plastics. Even the zipper foot, which should definitely be sturdy. Sure, you can’t hope for metal or other robust materials within this price range and category of weight. And I don’t mind plastics in itself, as long as it lasts and works. But the question is, will it last and for how long? Brother offers 25 years limited warranty and free phone support for the product’s lifetime, though. Just make sure you keep your receipt. I’m not sure if I should actually list this as a con, but let’s say it, just for the sake of complete honesty. It won’t handle thick materials well. For sewists who have experience with a wide variety of sewing machines, that comes without saying. Who would expect such a cheap, portable machine to sew through leather or denim? That’s what semi-industrial or industrial sewing machines are for. However, if you are new to the world of sewing, maybe you are going to need this warning. When it comes to stretchy fabrics, this little beauty won’t disappoint you. No case or cover included. This would also be a nice addition. I’m not saying it’s a crucial part or anything like that. Soft cases aren’t expensive, but you will still get the hassle of finding just the type that fits. I won’t lie to you that this machine is a do-it-all. It’s not, but you can’t even expect it to be a superman at that price. If you’re about to learn how to sew, it’s one of the best choices out there. The learning curve is very mild and there aren’t a plethora of options to baffle you. On the other hand, it will still be very usable as you hone your skills with time. And if your sewing enthusiasm doesn’t last, it will have paid for itself before it ends up in the basement. If you already have a fully reliable sewing machine, then this could be your second machine. Pack it up into a suitcase and bring it with you when on the go. The number of features and functions is pretty satisfactory and it will be able to tackle most of your projects. So, there won’t be much to complain about. It can also be an awesome gift idea for a DIY-curious friend or even a child. Sewing is made a lot easier these days than it was back in the olden days. And Brother is definitely one of the companies that we should thank for it.